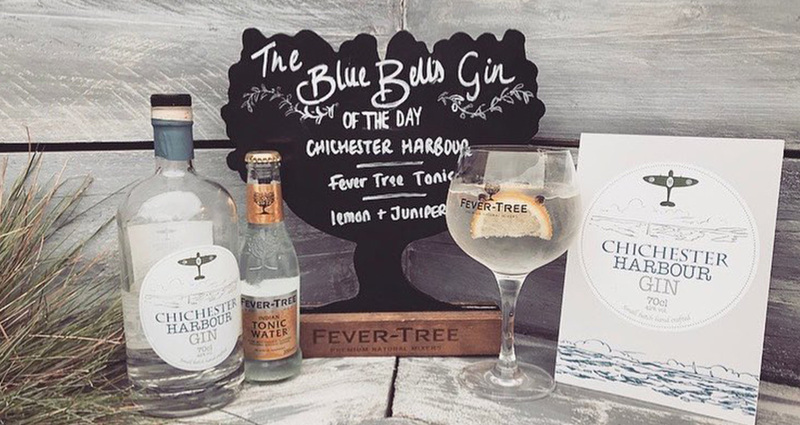 The Blue Bell Inn is located only yards from the quay in Emsworth, boasting terrific views from the terrace, and is renowned for superb food served in a proper pub. This busy local at the heart of the community is the perfect spot for a drink or a bite to eat after a walk around the harbour or a visit to the shops in the town. Well-stocked with a wide range of real ales and lagers, together with an extensive wine list, the Blue Bell, under the watchful eye of owner Giles, prides itself on serving fresh produce sourced locally. Nominated as one of the Top 20 pubs in the South-East by TripAdvisor in 2015, and recommended by The Times for its fish and chips, come and see what the fuss is about! (Free range egg, Goodwood back bacon, Treagust sausage, mushrooms, beans,hash brown, grilled tomato and toast). (As above x2 free range eggs, bacon, sausage and includes black pudding). (6oz sirloin steak with freerange fried eggs, grilled tomato and hand cut chips). (Tomato, bubble & squeak, fried eggs, mushrooms, beans and toast). Our breakfasts are cooked to order using fresh, locally sourced produce. In busy periods there will be a short wait. Served with salad garnish, coleslaw, granary or white bread or a freshly baked white baguette. A mild, semi-soft cheese with a mellow blue flavour and a slightly salty finish. A continental-style, semi-soft creamy medium strength cheese. A creamy, firm textured farmhouse cheese, similar to cheddar, with long, rich flavours and a tangy finish. With a selection of breads, olive oil and a balsamic dip. Home made chicken liver parfait served with toast & red onions chutney. Homemade soup of the day served with Southbourne Bake House artisan bread. Fresh ‘Blue Bell’ king prawns cooked with chilli, garlic and fresh ground spices, garnished with fresh coriander and a wedge of lime. Served with Southbourne Bake House artisan bread. Crispy deep fried breaded whitebait with home made tartare sauce together with artisan bread and butter. Whole baked Camembert stuffed with garlic and thyme, served with warm ciabatta and homemade chilli jam. Perfect to share. On a bed of balsamic dressed salad with chorizo and crispy pancetta. Served with a choice of hand cut chips, mash potatoes or new potatoes and garden peas or fresh vegetables. Not for the faint hearted this powerful chilli is packed full of flavour served with rice or chips and if you want to turn down the heat sour cream. Honey and mustard roasted ham with two free-range eggs, hand cut chips and handmade piccalilli. Served with garden peas. Served with hand cut chips, garden or mushy peas, homemade tartare sauce and a wedge of fresh lemon. With garden or mushy peas, homemade tartare sauce and a wedge of fresh lemon. Inspired by what Giles’ Mum used to serve him as a boy this rich classic lasagne is just like Mumma used to make! Served with salad and hand cut chips. Vegetarian lasagne, made with butternut squash, courgettes and mixed peppers in a rich tomato sauce layered with creamy bechamel and goats cheese, served with hand cut chips and salad. A combination of salmon, smoked haddock, cod and prawns in a creamy sauce topped with mash and cheese. Served with fresh vegetables. Treagust’s traditional sausages made in the local butchers 100 yards away, on a bed of creamy mash served with a rich onion gravy and garden peas. Mixed salad topped with prawns, hot smoked salmon and a classic marie rose sauce. Served with grilled tomato, field mushrooms, hand cut chips & garden peas garnished with watercress. Large slightly rounded steaks cut from the eye of the fore rib. They carry a little more fat than other steaks, but have a wonderful flavour. Sirloin steak has a great flavour. Steaks are cut to about 2cm (3/4 inch) thick and have a thin layer of fat running along the top of the steak. The gammon steak is a stalwart on pub menus throughout the land, ours is served with a free range egg & pineapple. 8oz sirloin steak (as above) topped with 3 garlic king prawns. We have a choice of lovely homemade desserts that change daily. Your choice of 1, 2 or 3 scoops. A selection of British cheeses with red onion chutney, walnut and raisin bread. Welcome to our new wine list, which we have compiled in conjunction with local wine wholesaler Hermitage Cellars. It is always exciting to put a new list together, looking for and tasting a range of wines that work as well by the glass as they do with our home cooked menu. We are delighted with the results and hope that you enjoy drinking them as much as we did tasting them. This Prosecco is distinguished by a rich array of fragrances that include accacia blossoms, honey, and apricot. The palate is soft and smooth, yet at the same time crisp and dry. The bouquet is redolent of raspberry, rose petals, and morello cherry, while the palate, crisp and very well-balanced, shows just the right degree of acidity, along with pronounced impressions of wild red berry fruit. Really quite complex with ripe apples, citrus, pear and a bit of creaminess. The palate is crisp and bright with some apple and pears as well as subtle bread and toast notes. This is pretty serious fizz. South Downs Natural Mineral Water is filtered through the deep chalk layers of the South Downs.